One scientific story has dominated the news this week: the first report of CRISPR-edited human babies being born. The story’s scientific and ethical aspects stirred up heated debate, as did its means of delivery: rather than a published paper, the story broke with reports of clinical trial documents and then a YouTube video from lead researcher He Jiankui (from the Southern University of Science and Technology in Shenzhen), all on the eve of a conference he was due to speak at (and whose organisers were seemingly unaware what we was going to speak about). 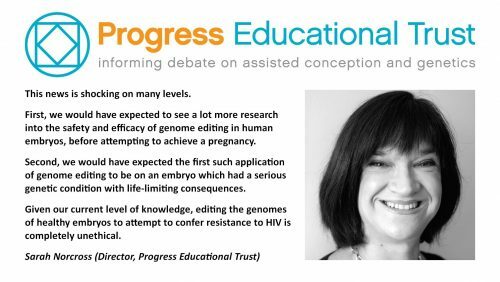 In an associated Node post, we asked developmental and reproductive biologists to give their reaction to the story (and we’d love to hear yours too), but here we’ve collated a bunch of hopefully helpful links, and some recent Development commentaries on the issues surrounding gene editing in humans. He’s talk begins at 1:18, and a Q&A moderated by Robin Lovell-Badge and Matthew Porteus starts at 1:39. Here at Development we’ve been thinking about issues of human gene editing for some time, and have commissioned content specifically exploring scientific and ethical aspects. We recently published two Spotlight articles on the theme (published in 2017 and 2018 respectively, before the current story broke). In Towards a CRISPR view of early human development: applications, limitations and ethical concerns of genome editing in human embryos, Alvaro Plaza Reyes and Fredrik Lanner discuss the use of CRISPR-based genome engineering in human embryos and the emerging themes therein. In Gene editing in human development: ethical concerns and practical applications, Janet Rossant summarizes some of the ethical considerations associated with the use of gene-editing techniques in human embryos and embryo-like entities, highlighting the need for open and informed debate. This is obviously a fast moving story so if you have any links you think other readers would find useful, let us know!